For a ship to sail, it needs to have a destination. Same thing applies to Digital Marketing. If you don’t have a plan in place, how can you expect to grow and innovate, to measure meaningful results and to learn from past mistakes? This article will help you realize why you need to start crafting a digital marketing plan that can pack a powerful punch. We have selected the 5 most important tips that as a CEO or decision maker should know to ensure that your digital marketing efforts create a real impact on your business. It is common that man companies don’t have digital strategy will not have clear strategic goals for what they want online in terms of gaining more revenue or promoting their business. Without proper goals and planning, all the efforts, money and time will be put to waste. Know what you want for your business and plan how to achieve it. One way to gain popularity online or maintaining the audience that you have is to know your audience well enough. In this way, you can juggle your strategy on what works and what not. In this way, you can assess the weak points and plan ahead how to improve it. For any marketing strategy, it requires manpower to start executing the plan and budget to make the strategy successful. Insufficient resources and lack of people will result on failing with the plan. Budgeting is very important and you need to be creative on how to achieve the goals with the budget that you have. Once the strategy is up and running, you need to make sure that you have the analytics as your reference for review. This is very important since you will know the basics and you’ll know your milestone and can create plan for continuous improvement for your digital marketing strategy. Later on, you will get to explore other aspects like search marketing, site user experience, email and social media marketing on your strategy. 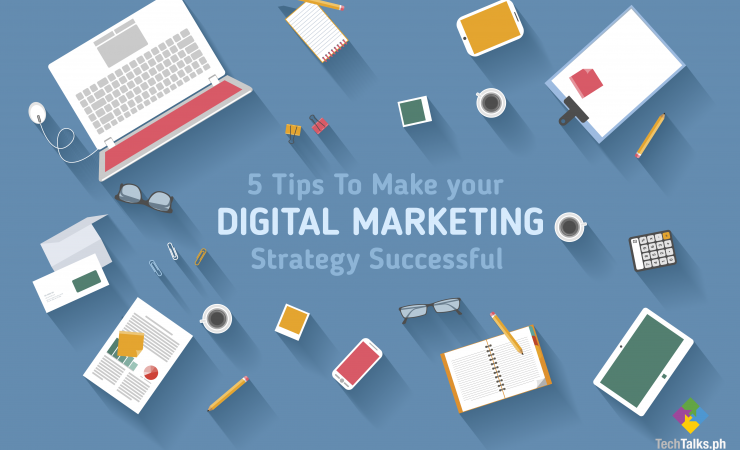 So, that's our top 5 Tips on how to make your Digital Marketing Strategy successful for your business. If you have other tips that you know will work for a business, feel free to share to us.